Would you like to play with sheltered cats in real time, on the Internet, with your keyboard in the comfort of your own home? The Humane Society of Utah has a way of doing just that. On Monday, the Murray Shelter (http://www.utahhumane.org/) got some fancy new technology donated to them by IPet Companion. You click on THIS LINK and get in line. When it’s your turn in the queue, you get 2 minutes to play. There are 3 different cat toys that move when you press a button. You can press to the corresponding cat toy, and interact with cats! There is also a fully operational camera that you can spin around the room to see what’s going on. It’s as easy as operating a television remote control. Utah is not the only shelter that has this incredible technology. The San Diego Humane Society in California also has IPetCompanion where the wait time is much shorter than the 2 to 6 hour wait in Utah. 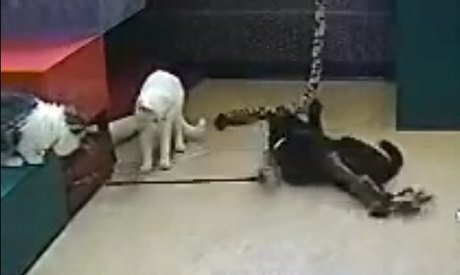 Also the Iowa Animal Rescue League would love you to virtually drop in and play with the kitties. 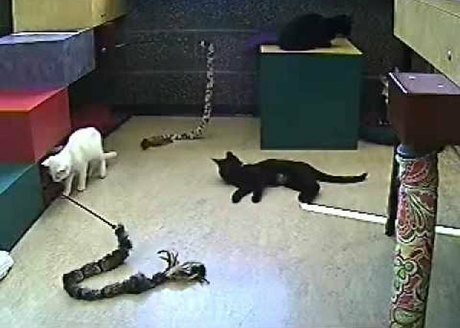 Would you like to see what’s going on and play with cats in the Welland & District Humane Society in Ontario, Canada, well click and find out! This is also a way for kids in hospitals to play with sheltered animals and has therapeutic qualities. Or if you love cats but happen to be allergic to them, look no further. IPetCompanion was specifically designed to end homelessness of sheltered animals and has definitely created an interest. Some of the shelters have few or no cats like the Idaho Humane Society, which I guess is a good thing. It would be a great world if this new technology helps lead to more cat adoptions and more lives saved. Follow IPetCompanion on Facebook or Twitter or browse all Playrooms HERE.